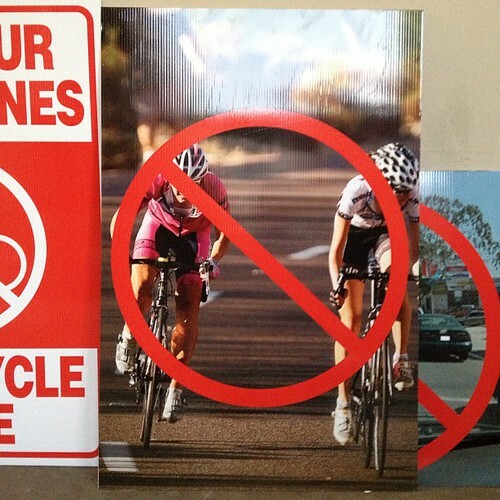 One of several anti-bike signs seen at Jose Huizar’s community meeting on Wednesday, March 27, 2013. 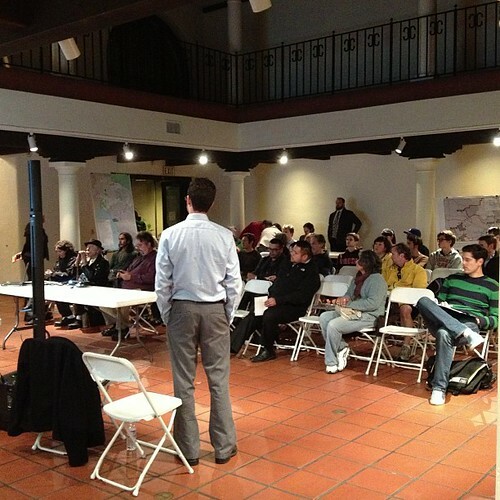 Bike Plan EIR meeting at the LA River Center on February 13, 2013. If we stay home and let the bike lane haters have their way, our streets can stay scary and dangerous car-only places. 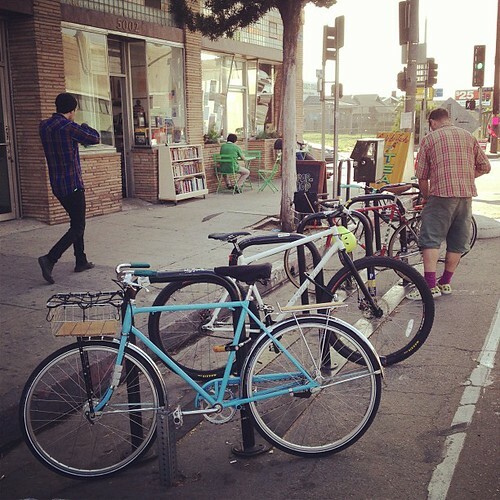 If we mobilize, our streets can also become safer, more livable, and better for local walk-up business foot traffic. Now is when we collectively decide if we want the anger, fear, and frustrations of a small anti-bike minority in this community, enraged about the symbolic loss of their status quo, to override the legitimate interests of the majority that live, work, and own property here. “Unused” (according to anti-bike laners) bike racks and lanes on York Blvd. Painting bike lanes is easy. Community hearings about bike lanes are the hard part. We’re two meetings down and at least 3 more to go until local politicians will give their nod of approval to the Los Angeles Department of Transportation (LADOT) to go ahead and install the bike lanes approved in the 2010 Bike Plan. 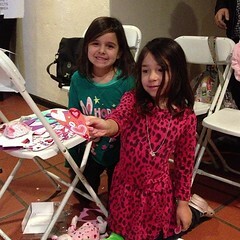 There were around 130 people at the Oxy community meeting. 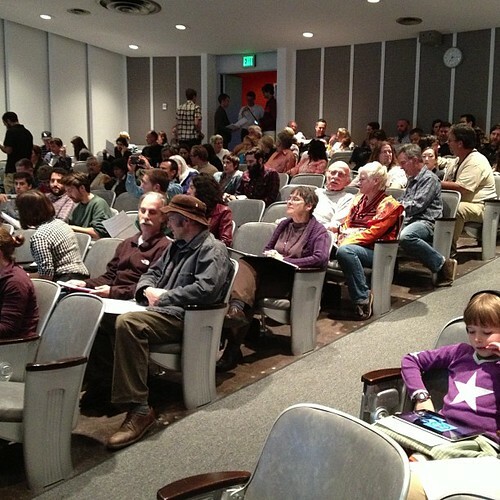 It was a packed house last night, Wednesday, March 27, 2013, at Occidental College’s Norris Chemistry building’s Mosher Hall. By the count of local newsman Tom Topping, over 130 people showed up to hear from the LADOT representatives and to make general remarks about bike lanes on Colorado Blvd. Some of us in the audience at Oxy had also attended an official hearing on the Bike Plan back on February 13, 2013 at the Los Angeles River Center. That meeting had close to 70 members of the public. 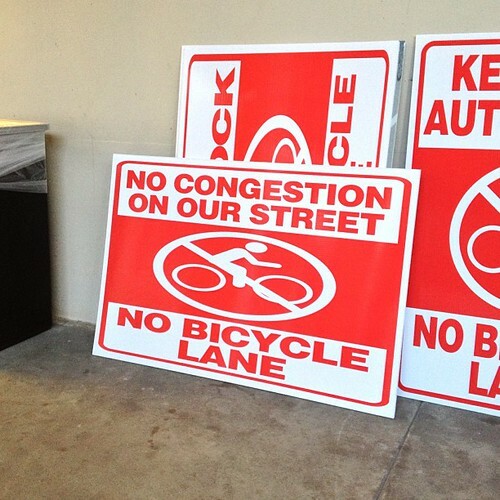 The comments about bike lanes on N. Figueroa St. and Colorado Blvd. can generally be clustered into two categories: those who want the lanes and those who really, really, don’t want the lanes. 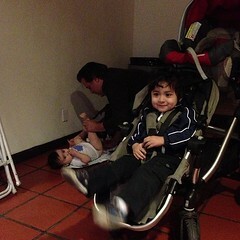 Bike lane supporters crossed many demographic lines, some brought their kids despite the challenges that entails. Those speaking out in favor of the bike lanes represent a wide demographic swath of the neighborhood: young, middle aged, old, single, people raising families, rich, and poor. Bike lane supporters also have come out both times in much greater numbers than anti-bike laners. At the February hearing, over 50 speakers in favor of the lanes voiced their support compared to the 3 against. At the meeting last night there were perhaps 20 people who spoke against the lanes and over 60 who spoke in favor of the lanes. Press from that first hearing was a pathetic attempt by both the Highland Park-Mt. Washington Patch and the Boulevard Sentinel to gin up controversy (and page-views) by ignoring the sentiment of the majority of the public – and instead airing as much information as they could about predicted peak hour motorist delay. In the case of the Boulevard Sentinel, their report claimed an extra hour of time would be added to car trips due to bike lanes – an absurd claim that only brought more strife to the next hearing (which happened last night). Behold, when a local paper wants to, it can produce some very ugly sentiments in people. The hate and animosity in the comments made by the anti-laners started shrill and has only turned nastier and more insane with each blog post, newspaper article, online comment section, and public meeting. 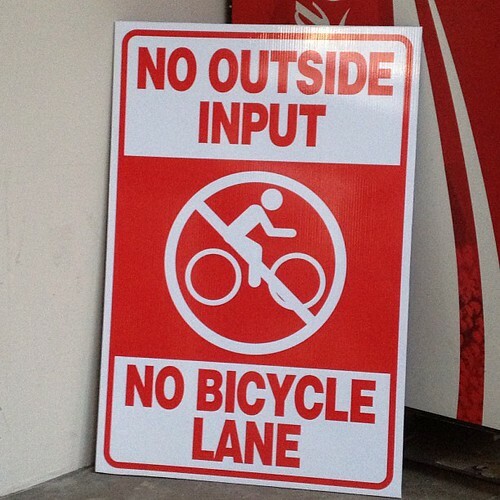 We are nearing the height of anti-bike lane sentiment in our community. The local press is having a field day stirring the emotional pot – covering the negative aspects of the bike lanes to get page-views from angry motorists. 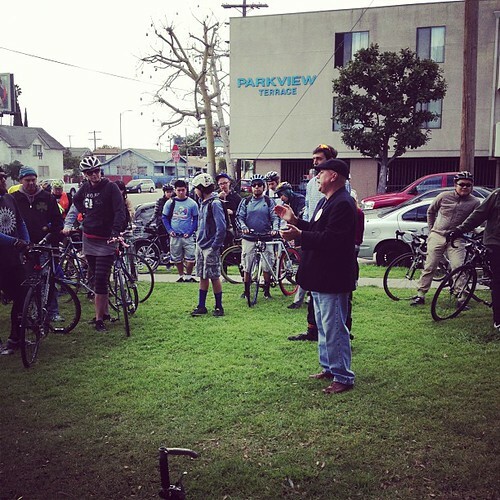 Councilman Ed Reyes speaking to 200+ bike lane supporters at a rally on February 10, 2013. I urge you to come out and let your opinion about bike lanes in North East Los Angeles be known. Bring your kids, bring your spouse, bring your family. If you’re a kid rocking a fixie or a BMX – your voice counts at these meetings! If you’ve enjoyed any of the past Dim Sum, Brewery, or Spoke(n) Art Rides we’ve done – come out and let the anti-bike lane folks see that there are reasonable people who support these lanes for a whole host of reasons.